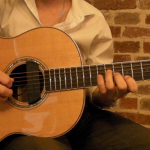 The first thing we need to learn is how to fret an open position G chord. 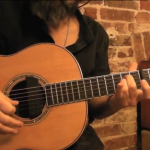 The video demonstrates how to play this chord. Use the loops to practice along with. Let’s learn the first chromatic exercise. 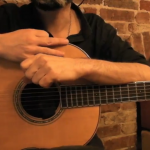 By moving up and down the neck like this, you will gain control over your picking technique as well as develop fine motor skills in your fretting hand. 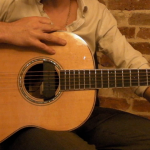 In this lesson, we are going to take everything we learned in the first lesson and apply it to three new open position chords. The chords are Em, D, and Cadd9. When you learn a song there is one thing you must always do and that is to break it down into smaller chunks. So let’s do that, let’s break it down before we build up to the full strumming pattern. This is a great exercise for warming up. 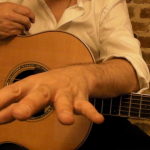 You will improve your left hand’s finger dexterity as well as your right hand’s picking technique. Put together, what we really work on is the coordination of the left and right hand. In the last lesson about ‘Talking About A Revolution’, we strummed the chords, today it’s time to pick the chords instead. Practice all examples along with the loop. In the last few lessons, we’ve slowly built up to learning how to play ‘Talking About A Revolution’. The time has finally come to play the entire song from beginning to end. 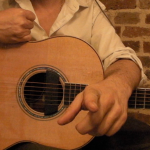 Today we’re going to learn how to change key, apply a capo and create a 2nd guitar part. To change key from G to C we move all chords in the same way. The simplest variation we can develop from this is to simply start high up the neck and move down the fretboard instead. This concept can be applied to all future chromatic exercises. 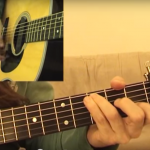 Today we start looking at another acoustic classic in ‘Redemption Song’ by Bob Marley. 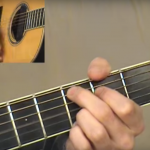 Today we take a look at how to mute when you strum. 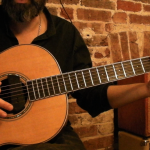 You’ll discover how different chords will require different muting techniques. 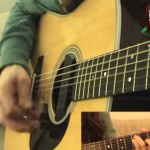 Use the chords G, Em, Am, C, and D over each example as demonstrated in the video. Today we play the more exact parts of ‘Redemption Song’. The intro and outro need to be done like on the record, the guitar break is down to you to design. In chromatic exercise 2, we play using 16th notes, which means 16 notes in a bar. 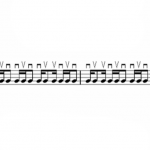 All this means that if you can play the first exercise at 100 BPM, you can automatically play this exercise at 50 BPM. Let’s have a crack at Redemption Song’ in all its glory, from beginning to end. Simply play along with me in the video. Keep one eye on the TAB. Today we learn how to construct a 2nd guitar part for ‘Redemption Song’. This means you can soon join me and the singer, which is what happens in the final step. You don’t have to follow the patterns I just showed you in the last step perfectly. 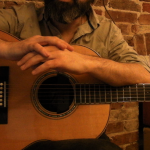 Since the first guitar is so consistent, you, as a 2nd guitarist, can afford to be a bit more experimental. 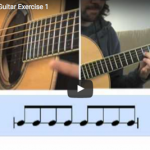 To ensure you can clearly see the difference between 8th notes and 16th notes, let’s practice all examples shown in the video lesson to a metronome. Today start working on a new song that contains a new slash chord. 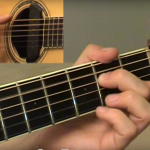 We touched on this as you played ‘Redemption Song’ with the G/B, today we learn a D/F#. When playing chromatic exercise 3, we play three notes per beat, but four notes per string. This means that the weight of the downbeat will start to correspond with different fingers. Today we keep exploring how to play ‘Robin Hood’ by taking a close look at the chorus and turnaround which are more complicated than the verse. We also look at the outro. Today we put the three chromatic exercises together. 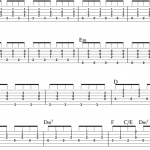 Practice all exercises as the TAB describe before you start combining them in an improvised way. 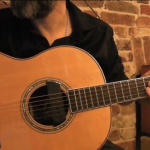 In this video, I play ‘Robin Hood’ with a singer from beginning to end. To make it easier to follow along, I’ve included a rhythm chart. 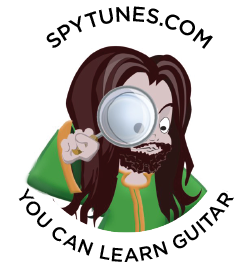 Today we create a 2nd guitar part for ‘Robin Hood’ by changing the key to C and placing a capo on fret 7. You’ll get TAB for everything. 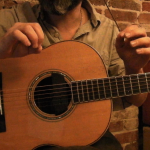 Keep that capo on fret 7 and join me and the singer to play ‘Robin Hood’. 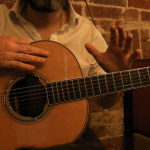 There’s a chart that you can keep an eye on as you strum and pick your way through it, in an improvised way. 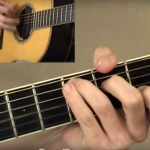 The chromatic exercises are great for developing left and right-hand coordination, improve accuracy and speed. It’s also a great exercise for warming up, so let’s start with that. Today we start working on a new song in ‘One More Cup Of Coffee’. Only four chords are used in this song. Instead of feeling at home with chord I, we find our home in chord VI as this song is “in minor”. Decide for yourself how you want to practice this concept. 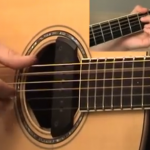 Do you play all string pairs before you change the BPM, or just one? It would be a good idea to play at a tempo where 100% accuracy is achieved as speed is a consequence of accuracy. 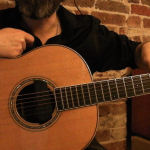 Today we look at a bunch of chord variations you can use when playing ‘One More Cup Of Coffee’. These are not necessarily what you’d hear on the original recording but put in place to make the arrangement work better on just one guitar. Today we develop last lessons string pair concept for the chromatic exercise by skipping strings, this makes it much harder! You decide what tempo is right for you. Focus on 100% accuracy. Today we play through ‘One More Cup Of Coffee’ from beginning to end. Simply play along with me and the singer in the video. You don’t have to use the same extensions or exact rhythms. 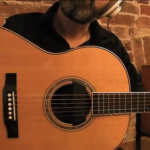 Today I’ll show you how you can construct a 2nd guitar part for ‘One More Cup Of Coffee’. 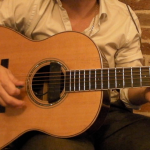 We’ll do this by switching key from C to G and then placing a capo on fret five. In our final study of ‘One More Cup Of Coffee, it’s time for the four of us to sound more like a band. I’m playing the big chords, you got your 2nd guitar part, Barry is on violin and Miss Al Brown sings. Today we start revising everything you’ve done in the first half of this beginner course. First, we see if you can play along with the first three chromatic exercises at the tempo I do in the video. Let’s go back and play ‘Talking About A Revolution’ and ‘Redemption Song’ again. 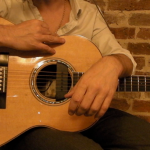 As we do, let’s try all the things we discussed, picking and strumming, with and without a capo. Use this as a warm-up for no more than twenty minutes. Remember to stop and stretch your arms, shoulders, hands, and fingers regularly. As you stop and stretch, increase your BPM with 2! Let’s play ‘Robin Hood’ and ‘One More Cup Of Coffee’ again. 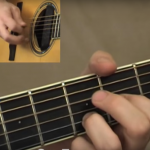 Try all picking and strumming parts, with and without a capo. Today we start looking at a new song in The Verve’s monster hit ‘The Drugs Don’t Work’. The chords are all from the key of C. Let’s start by looking at the chord progression and how we can extend the chords. Let’s take a look at the strumming pattern for this song. We are dealing with a 16th note pattern at a slow pace again. It’s the same pattern for all chords, even when there are two chords in one bar. Today you’ll learn a for 2nd guitar part ideas for ‘The Drugs Don’t Work’. These parts are picked one note at a time. 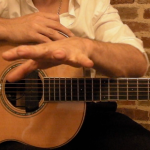 In this last step, we fit a capo on fret five and work on playing picked and strummed parts as if in the key of G.
This then becomes a more creative 2nd guitar part you can play along with the original video. Today we start looking at a completely new way of playing the chromatic exercise, we now travel across strings in a sweeping motion. We do this in preparation for playing a new song. Let’s start learning ‘Time Of Your Life’. As the pattern is pretty fast, take your time. It’s much better if you can play it well at a slow speed, than fast but not accurately. How many times do you play the looped pattern before you stop for a break and increase the BPM? Perhaps 20 seconds playing, 10 seconds resting is a good idea. It’s time to look at the chorus for ‘Time Of Your Life’. It’s only a few bars long. Practice this exactly as the TAB show, very slowly at first. Today we move on to the next sweeping exercise. Just like when we developed the first chromatic exercise, we now change to 16th notes. 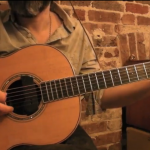 In this lesson we play ‘Time Of Your Life’ using a strumming pattern. This is much more difficult than I assumed, it’s fast! 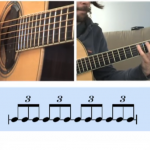 Just like with the chromatic exercise, we can fit a triplet rhythm to the sweeping exercise. And just like before, the downbeat will now start corresponding with different fingers. The time has come to create a second guitar part for ‘Time Of Your Life’. 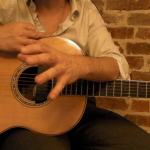 The easiest way to do this is to use the same pattern but change the key and therefore chord shapes and apply that capo. 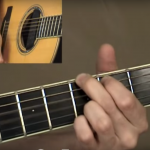 Today we look at reading and playing a bunch of 16th note strumming patterns. 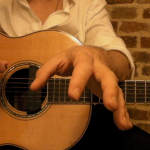 This is something you will do a lot of when playing the guitar so learning how to read and play them well is imperative. In this step, we play the progression of ‘Wonderwall’ with and without extensions. This will enable you to more clearly hear the difference the extensions make, once we add them. 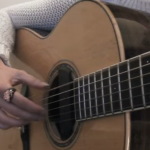 Let’s look at how to play the strumming pattern for the verse of ‘Wonderwall’. By practicing these you will realise the difference between what makes you sound like a beginner vs an experienced player. 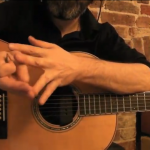 Let’s take a look at some more 16th note strumming exercises. These are not very musical, but they’re great for your strumming technique. Just like we did when we played the verse, let’s play the chords like a beginner before we start breaking the patterns up. 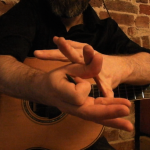 In this step, you’ll learn how to strum the chorus for ‘Wonderwall’. Since this is so easy, we quickly move on and play the complete song as well. The time has come to create a 2nd guitar part for ‘Wonderwall’. Learn this and you can play with me and the singer, rather than just playing the same thing as me. 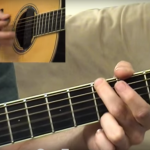 In this step, we revise the 16th note strumming patterns you’ve been working on lately. As we practice these, we push the BPM! Today we start working on a new song as we learn ‘Rewind’ by Paolo Nutini. In this step, we focus on the chords. 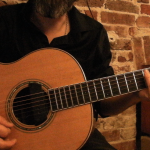 Just like in ‘One More Cup Of Coffee’, chord III has been modified into a major chord. 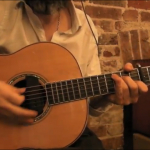 To play this song using the same strumming pattern I do, learn it by breaking up the bar. Play the first beat, hold the last chord. OK, let’s challenge ourselves with some 16th note reading exercises. First, pick a video in the playlist. 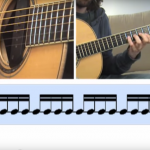 Study the up and down strokes and work out how to play it, without playing the video first. This is the last time we play ‘Rewind’ and actually the last time we play with a pick. 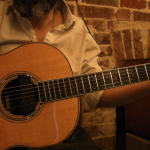 From now on, all lessons until the end of the beginner course will be played fingerstyle. 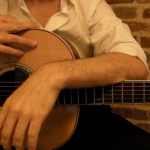 It’s time to learn our first fingerstyle song. 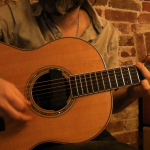 The ‘Beginner Guitar Song’ is a nice meditative little loop that you can play for ten to twenty minutes or so without getting bored. Today we learn how to group strings depending on the chord shape. 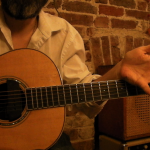 There are some basic rules like this when playing fingerstyle guitar. Let’s look at and practice them. 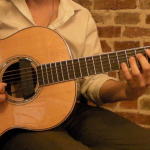 Let’s revisit the ‘Beginner Guitar Song’ and learn the last two variations. 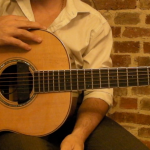 There’s TAB for the original part and all variations in this lesson. 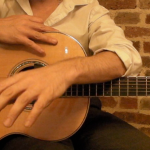 Today we look at another Etude. Remember, it is always best to practice using a metronome, playing the examples at different tempos. Today we start working on the last song of this course as we play ‘Ain’t No Sunshine’ by Bill Withers. ‘Ain’t No Sunshine’ is a modern standard, expect it to come up in many jam sessions and gigs. 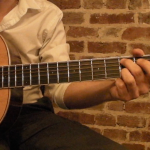 Let’s take a look at the exact fingerstyle pattern used in the video. I use two fingers to pick the chord on the upbeat and my thumb to play the bass line on the downbeat. 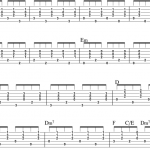 Today we continue to work on ‘Ain’t No Sunshine’ as we read a chart and play the complete song. 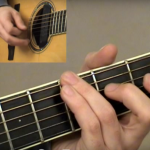 Keep one eye on the chart and the other on the video lesson as you play along. Let’s consider a few alternative parts for this song. 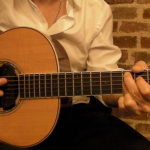 We still maintain the Em – G movement and stay at the bottom of the neck using open position chords. 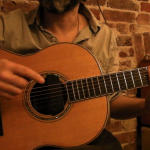 Today we create a 2nd guitar part for ‘Talking About A Revolution’, fingerstyle. 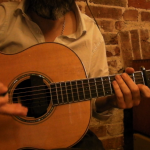 Use the TAB and original video to play along with me and the singer. 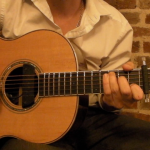 Today we create a 2nd guitar part for ‘Redemption Song’, fingerstyle. Use the TAB to play along with me and the singer. 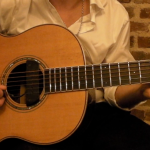 Today we create a 2nd guitar part for ‘Robin Hood’, fingerstyle. Play along with me and the singer in the video. 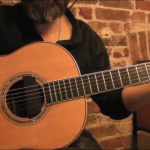 Today we create a 2nd guitar part (fingerstyle of course) for ‘One More Cup Of Coffee’. Use the original video lesson to play along with me, the singer and Barry who is still hanging in there with his violin. There’s the TAB for what you could play for the verse/chorus. Use this as you play along to the original video. After a while, start developing the part by changing the order of how you pick the strings. 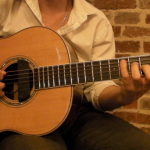 Today we create a 2nd guitar part for ‘Time Of Your Life’, fingerstyle of course. 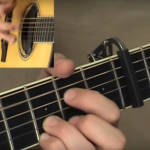 There’s complete TAB available as we play using a capo on fret 7. 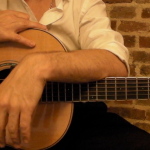 Today we create a 2nd guitar part for ‘Wonderwall’, fingerstyle. Play along with me and the singer using the TAB. 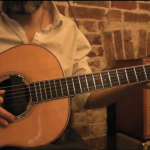 Today we create a 2nd guitar part for ‘Rewind’, fingerstyle. 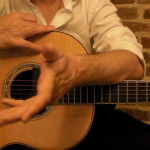 This is easily the most complicated fingerstyle arrangement in this course. Today we play through all beginner songs in a row, just like if we played a gig together. I’m not giving you any TAB as this is a test to see if you can play all these songs.